Karuppu Raja, better known as Ganja Karuppu is a film actor who plays comedy roles in Tamil films. He started his film career in Bala’s Pithamagan in 2003 and went on to appear in more than 100 films. Ganja Karuppu was born on 5 January 1976 in Sivagangai, Tamil Nadu to a farmer family. He had to go through a rough childhood because his parents couldn’t able to afford him good education due to poverty. He went to school only to have afternoon meals, the scheme that has been benefiting lakhs of students in villages. He ran a hotel business in his home town before becoming an actor. Director Bala is his distant relative who offered a role in his directorial flick Pithamagan in 2003, making his film debut. In his second film Raam, he played the role of Vazhavandhaan and the performance in the film earned him fame and critically acclaim. The success of the film fetched him several offers in Tamil films for comedy roles. Ganja Karuppu has appeared in more than 150 Tamil films and apparently was the most sought comedian in the late 2000s. Some of his notable films are Sandakozhi (2005), Paruthiveeran (2007), Arai En 305-il Kadavul (2008), Subramaniapuram (2008), Naadodigal (2009), Kalavani (2010), Thambikottai (2011), Poraali (2011), Isai (2015), Dharma Durai (2016) and Thondan (2017) among others. Ganja Karuppu has also produced a Tamil film Velmurugan Borewell in 2014, which ended up as a disaster at the box office. He invested all the money that he earned during his career in the film, but the film’s failure affected him severely. Consequently, he didn’t get film offers as he got before. 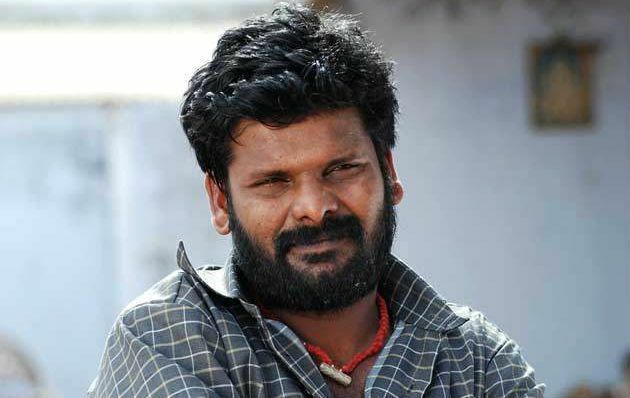 He was last seen in Samuthirakani’s family drama Thondan. Ganja Karuppu is married to Sangeetha, a physiotherapist, in 2010. They together have three children. He was one among the 15 contestants in the first season of Bigg Boss Tamil, hosted by Kamal Haasan and was evicted from the show on Day 14.